The best outdoor spaces—whether they're 100 square feet or 10,000—are carefully curated, thoughtfully designed, and, most importantly, inviting. A winner could be an oasis, a party zone, a sales lure, or just a slice of (semi) natural beauty. Too bad, then, that so many homeowners view their high-potential outdoor spaces as an afterthought. They put off improving them because they assume they'll need to spend a waterfall of cash on extravagant features. Au contraire! A luxe-looking outdoor oasis doesn't require infinity pools and marble statues. In fact, you can create a relaxing, resort feel in the great outdoors in no time—and on a budget. 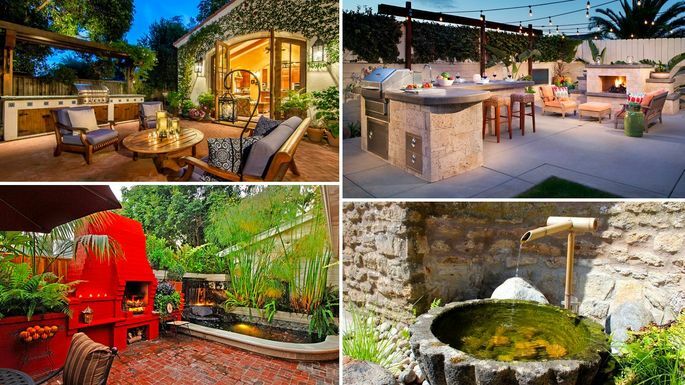 We consulted with landscape designers from coast to coast to grab some of their best tips for making your outdoor space look luxe for less. So mix up a batch of dirty mojitos and take a look at these tips—we'll meet you outside. 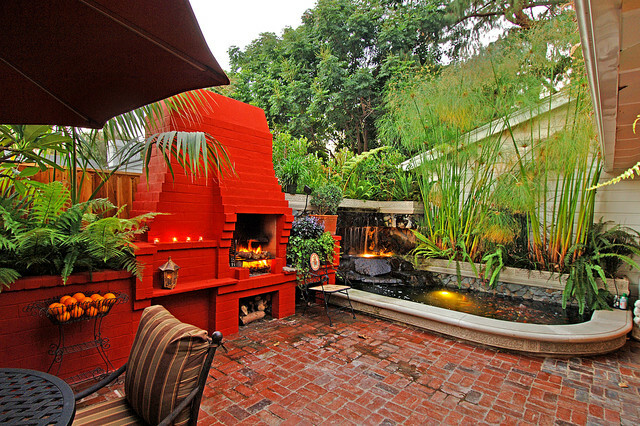 A haphazard outdoor area will scream "cheap." Or messy. So before you dive into creating your space, make sure you have a plan. "Know what you want to achieve—how you want to feel in you space, what functions you want to carry on and what image you want to project," says artist and designer Pablo Solomon. "Study what you like about luxurious landscapes that you have seen, and then try to incorporate those elements into your space." He advises clients to imagine they're creating postcards as they frame views to and from their home. "We usually think of landscaping as having some basic zones—the central focus (usually your house), the spaces surrounding your focus, the perimeter of your property and the lines of sight/paths connecting those elements," he says. Consider these zones as you map out your dream space (seriously, put good old-fashioned pen to paper on this one) and incorporate Solomon's five elements into your plan. 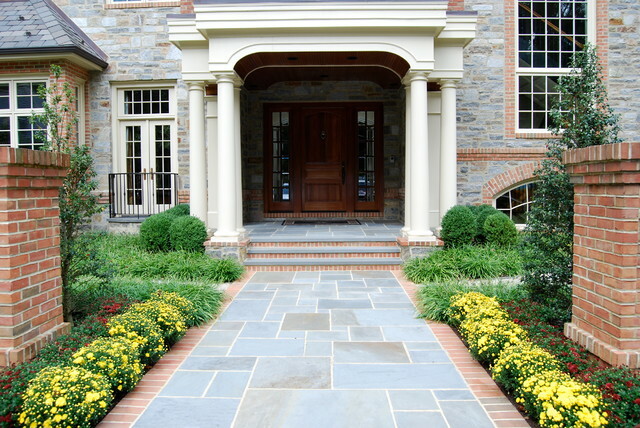 To get the most luxe bang for your buck, spend your dollars where they'll make the most impact: the front entryway. "Lay a pathway using brick, cobblestone, or even concrete—and if you choose the latter, take it a step further by painting it in contrasting colors," says Brian Rhoden of Daniels Lawn Service in Orlando.. "Two contrasting colors, such as black and gold, give an air of luxury without breaking the bank." Then line your fancy new pathway with inexpensive greenery and voila! Solid first impression. According to San Francisco-based design pro Gina Gutierrez, "sections" are key to creating spaces with purpose. "If you have a larger outdoor space, I always recommend divvying up the yard so your space doesn’t feel too much like one large square," she says. "Within your space, section off an area for perhaps a kitchen or grill, a place to dine with family and friends, a bar area where you can curate drinks over conversation, a comfy and intimate seating area, or a peaceful space for gardening." Create flow and continuity among these sections with similar colors, textures, patterns, and lighting concepts. "Otherwise, the space will become too noisy or busy," she says. "Stick to a color scheme or style theme, and you can’t go wrong." And when in doubt, think minimal. "Often the key to an expensive look is not excess," Rhoden says. "The key is in accentuating details." Stumped for ideas? Solomon recommends a well-placed sculpture or interesting planter to give your space a luxe look for less. 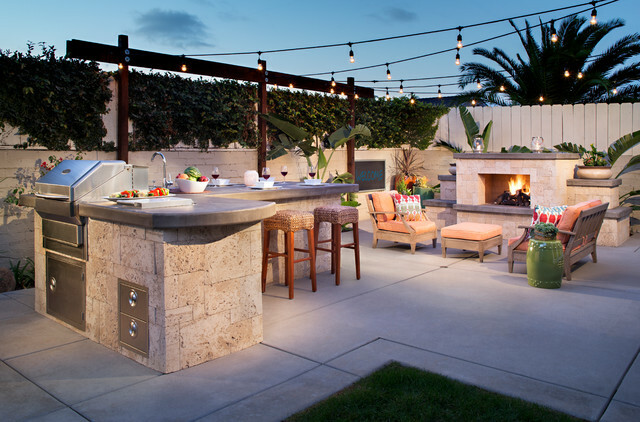 "Seating arrangements are key to a purposeful patio," Gutierrez says. "You want to create a space for friends and family to gather, no matter how tiny or large the space is." For smaller patio spaces, Gutierrez likes seating options that come in a set—"then create the style and ambiance by bringing in accent tables and decor with different colors and texture." Miami Beach-based landscape designer Fernando Wong, who recently designed the gardens for the Four Seasons Hotel at The Surf Club in Surfside, FL, recommends grouping white chaise lounges by a pool or water element to "instantly elevate" your outdoor setting. That worn-in look can actually give off a very expensive vibe. 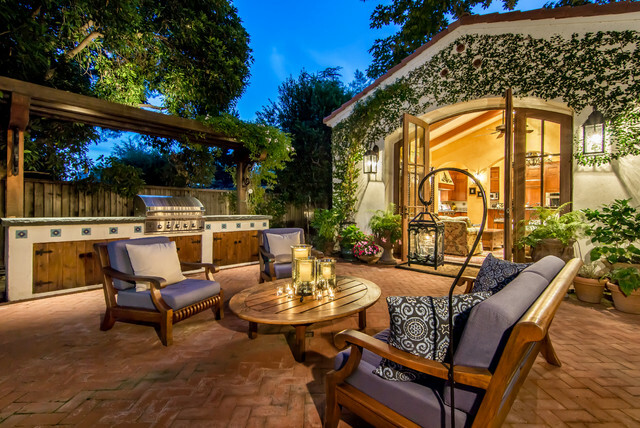 Give your outdoor space an air of vintage luxe by using old bricks or reclaimed wood when building patios, decks, doors, and furniture. 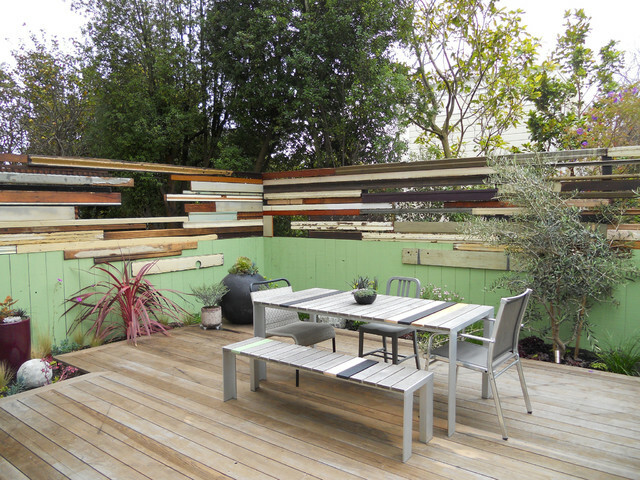 Or try upcycling some of your old furniture into something brand-new for the outdoors. "Beams and doors used in old barns that are being torn down can be salvaged for cheap or free," says Andy Knutsen, president and owner of Knutsen Landscaping in Lancaster, PA. "Old kitchen furniture can be fixed up or repurposed to create a fresh new piece, and stones from a garden or driftwood from a river or beach work great to add character to a backyard space." As recently as a few years ago, mass-market outdoor rugs were scratchy and cheap. But these days, you can find luxurious, comfortable options that can withstand the elements (and icky mold) while pleasing the eye. Just be sure to vacuum your rug on a regular basis and roll it up to store inside at summer's end. You'd be surprised what a fresh coat of paint or stain can do in the great outdoors. Move beyond boring grays and browns and channel a luxurious feel with pops of contrasting color—"smoky charcoals, sharp black, and even a pop of a saturated red or blue," according to Ostap Bosak, manager at Marquis Gardens, a water feature and pond supply retailer in Toronto. Think sleek, dark planters, black or charcoal garage doors and trim, and boldly hued rugs, lanterns, and fireplaces. 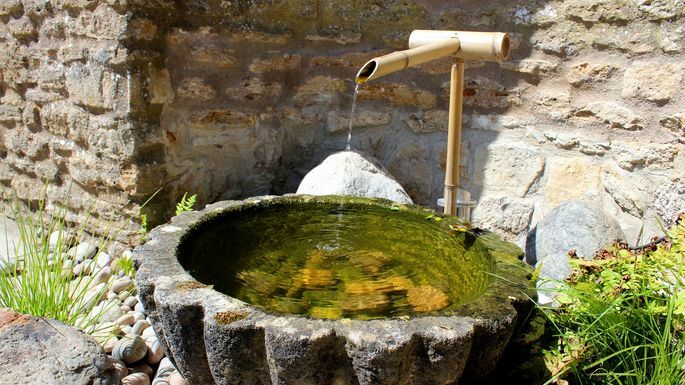 Perhaps a Japanese Zen garden bamboo fountain? Contrary to popular belief, "a water feature doesn’t have to be some large investment that only a professional can install," Bosak says. A simple water feature can start at several hundred dollars and can take less than hour to install yourself. Bosak recommends something low-maintenance and easy to set up, such as a bubbling urn or patio fountain kit. 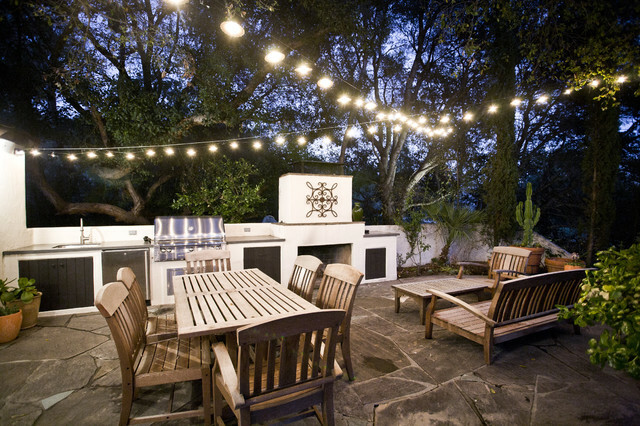 Experts agree on this one: String lights are one of the most affordable forms of lighting for an outdoor space and are well worth the outlay. "They have a nice clean look, are easy to install, and are built to withstand the elements while living outdoors," Knutsen says. What's more, they introduce an overhead element that designers covet to bring scale to the space. To make your lights as energy efficient (and bright) as possible, use LED bulbs.